The couple were attracted to the simplicity of the home’s design, which reminded them of Frank Lloyd Wright’s distinctive architecture. 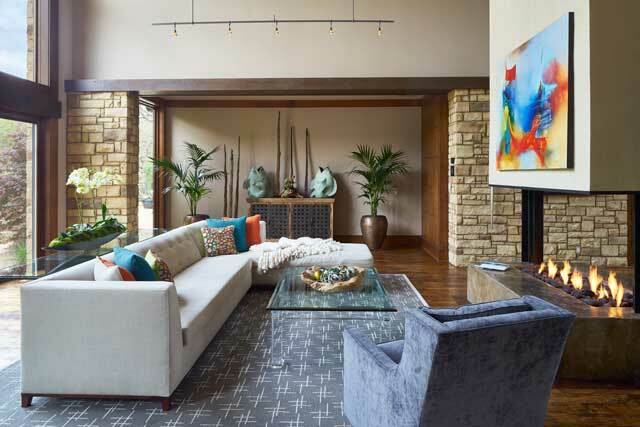 It was love at first sight when Kelly and Kathy Caviness of Caviness Landscape Design discovered a spectacular lodge-style home nestled in a secluded, wooded area in Arcadia, east of Edmond. “We feel like we are on vacation every day in our home,” Kathy says. What also appealed to them was the home’s strong resemblance to Frank Lloyd Wright’s distinctive architecture. Dramatic lighting illuminates the rear setting of this luxurious home. A natural waterfall cascades over rocks, rushing toward a pool. Flagstone steps lead to the rear patio. The couple purchased the home a year ago, although it was built in 2008. Bockus-Payne Associates provided the architectural design; the late Mark Dale was the builder. “The star of the home is really a 200-year-old post oak tree, surrounded by other mature trees, numerous hillside grade changes and a waterfall that cascades over rocks into a pool at the rear of the home. 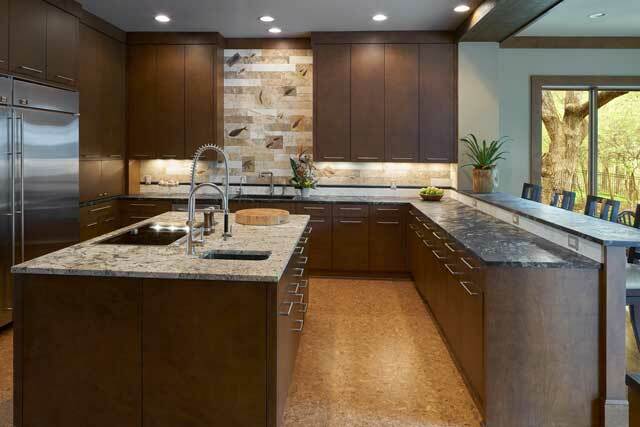 The sound of water is an important feature in all our designs,” Kathy says. Floor to ceiling windows in the home’s 15 rooms and natural lighting complement nature’s beauty. The exterior of cedar and native stacked stone is accented with a metal roof, a large porch, a dramatic flagstone walkway, a dry creek bed and the historic tree. Two large fire bowls mark the entrance. A gridlock pattern is featured in the entry door and the flooring. Sunlight filters through to the adjacent dining room. A dramatic water wall provides a peaceful, soothing sound and is a buffer between the entrance and dining room, and a shaved elk horn chandelier illuminates the room. An arched doorway with an antique prison door from La Puerta, Mexico, leads to the wine cellar. With the open floor plan, the formal living room faces the dining room. A dramatic fireplace with a concrete base anchors this area. Floor to ceiling windows open to the patio and stream bed. The kitchen and adjacent bar area are designed for entertaining large groups. Granite countertops and Gaggenau appliances enhance this area. A hand-hewn stone wall in the bar is an impressive feature. While the kitchen, dining and main living areas serve as public spaces for entertaining, the master suite is a peaceful haven for the couple. The bedroom fireplace is identical to the one in the living room. The sheer bamboo shades double as blackout shades, and an expansive window faces east. “It’s wonderful to watch the sunrise from this room,” Kathy says. 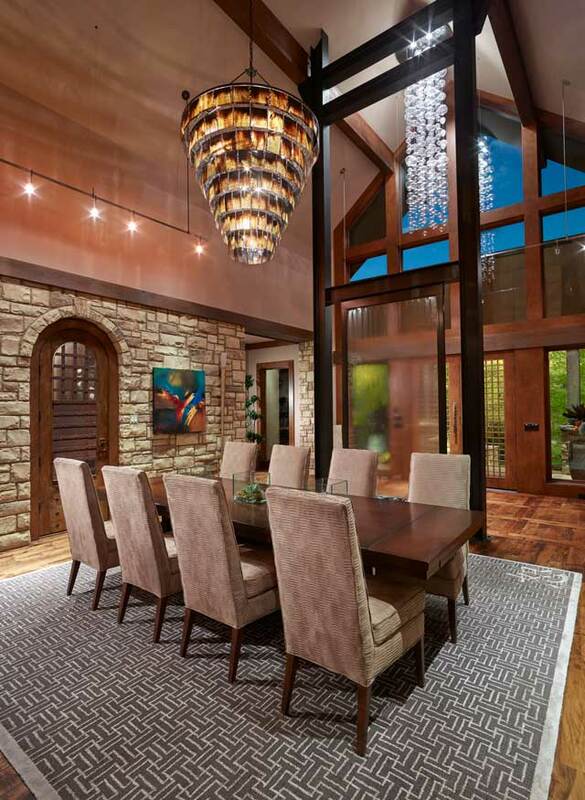 The formal entry’s teardrop crystal chandelier lights the way to the exquisite dining room. A custom rug under the dining table is accented at the four corners with these Asian symbols woven into the fabric: Courage, Harmony, Love and Forgiveness. Unusual features in the kitchen include a cork floor, a Gaggenau induction stove, convection and steam oven and a backsplash including fossil imprints of fish, birds, shells and leaves. : Near the master suite is a cozy study. The stone slab desk with embedded fossils houses hidden storage space. The master bath affords another view of the surrounding landscape. Among the amenities are seven shower heads, a coffee bar and under-counter refrigerator. Teak surrounds the master bath. Fish-patterned drawer pulls from Designer Hardware by Faye are a unique accent. “Even though there’s plenty of light, it is a very private space leading to the spa area,” Kathy notes. Near the master suite is a cozy study where the couple does landscape design projects. The stone slab desk with embedded fossils houses hidden storage space. Photographs of International Awards of Excellence from industry peers for past projects hang on the walls, and the custom-made door was inspired by an Oriental screen. Off the study and master bath is Kathy’s favorite room – a screened-in porch set high above the landscape. “The whole wing feels like being in a tree house because we look out to the canopy of dense trees on our lot,” she says. With each room providing a unique view of this beautiful setting, the couple can enjoy nature’s ever-changing theater. This luxurious home, with so many outstanding amenities, provides a grand setting for entertaining as well as a haven for casual times to enjoy the scenes nature provides each day. Among the special bedroom furnishings are a bed from the Williams-Sonoma Collection, night stands and bedding from Restoration Hardware, a contemporary painting and a teak chest. Kelly Caviness was attending Oklahoma State University on a full jazz scholarship when he got sidetracked by a horticulture class. “I discovered a great love for landscape design,” he recalls. 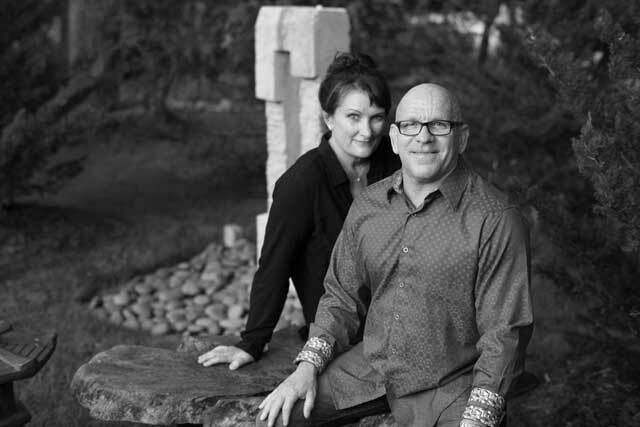 Today, Kelly and Kathy Caviness are the owners of Caviness Landscape Design in Edmond. Kelly designs, and Kathy is the bookkeeper/marketing specialist. 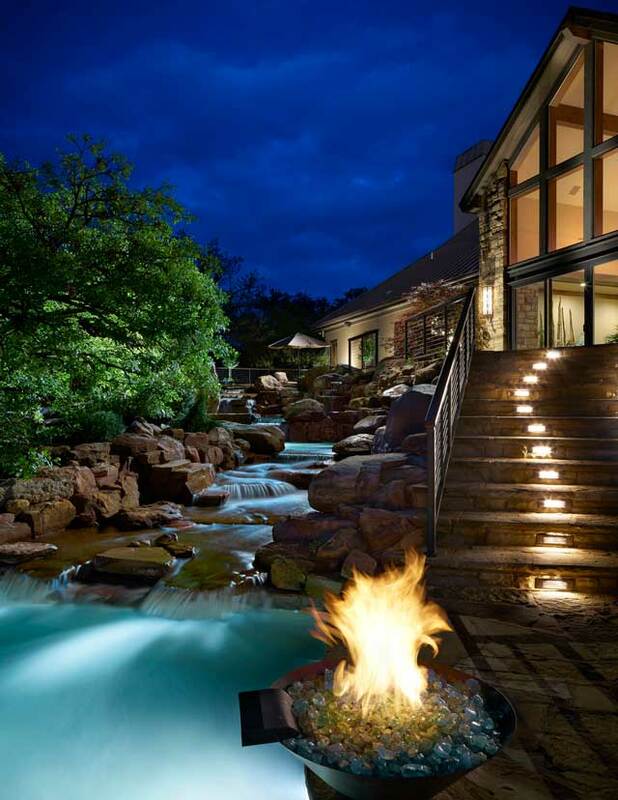 Theme pools and outdoor living spaces are their signature. His designs are featured on HGTV and the Discovery Network. An Oklahoma City pirate theme pool will be shown on DIY Network’s new Pool Kings series. 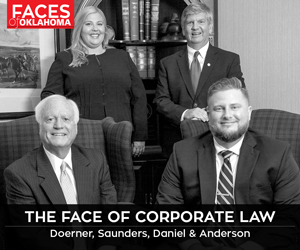 Among his favorites: swim-through grottoes cascading into a lake, waterfalls, a scuba pool and an underground slide exiting into a miners’ theme pool.